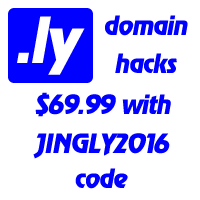 Name.ly/PRO allows third-parties to run their own domain name registries and link bundlers. If you own domain names like Irish.Me and would like to offer similar functionality, including blogging, custom DNS and email forwards, Name.ly will be able to provide such a registry solution at no fee. In fact, the domain owners will receive 50% of the premium proceeds (by default charged at $12.00 per account per year). Services similar to those offered by Brief.ly, Links2.Me, Many.at, and other Name.ly/Sites on their own domain names, under their own private label. It is also possible to add Name.ly/PRO functionality to existing sites without changing their status quo. In its essence, domain name owners can either cash on their virtual assets by organically growing the customer base and benefit from premium proceeds or use Name.ly/PRO to host their network of sites. The former is free to apply for, with corresponding 50%50 revenue split model. The latter is provided for a monthly fee of US$ 99.00. When parked, a domain name that has 50 subscriptions per month generates > $7k per year. As full DNS support is in place, it is like running your own zone on the second-level-domain. Like it is the case in domaining industry, the customer loyalty is above 60% of annual renewals. Domainers receive half of the premium proceeds and retain the ownership of the name. The domain name is branded under its own name, builds the traffic organically, hence the increase of the value passed to the future buyers. At the moment, PRO version is on its stable beta stage. In the past, we have alpha tested the platform that now fuels hundreds of sites with dozens of thousands of active registrations. P.S. Customers willing to create registries on multiple domain names do not have to submit repetitive applications for each site (we know everyone would hate this). For any bulk queries or should you have any other questions, do not hesitate to pitch Name.ly/PRO team at: pro at name dot ly.